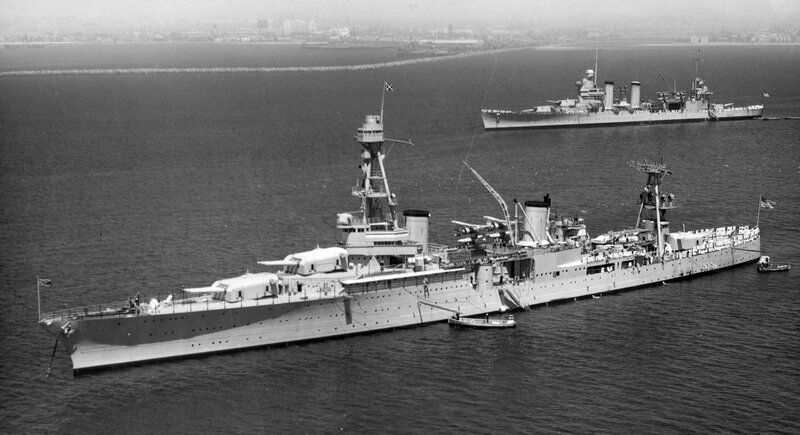 USS Houston (CA-30) in 1934. Courtesy of the United States Navy and the United States Naval Institute. Image available on the Internet and included in accordance with Title 17 U.S.C. Section 107. Elizabeth Holcombe stands with U.S. Navy officers aboard the USS Houston (CA-30) at its launching ceremony, 1929. Courtesy of the University of Houston Libraries. Image available on the Internet and included in accordance with Title 17 U.S.C. Section 107. USS Houston (CA-30) passes through the Panama Canal, 1934. Courtesy of the United States Navy. Image available on the Internet and included in accordance with Title 17 U.S.C. Section 107. HOUSTON. The first Houston was a captured Collier Libenfels, taken from the Germans upon American entry into World War I. The second Houston was a heavy cruiser of the Northampton class, launched at the Newport News Shipbuilding and Dry Dock Company, Newport News, Virginia, on September 7, 1929. She was christened by Elizabeth Holcombe, the daughter of former Houston mayor Oscar F. Holcombe. The ship had a standard displacement of 9,200 tons, was 600 feet 3 inches long, and had an extreme beam of 66 feet 1 inch. She had a rated speed of 32.7 knots, mounted nine eight-inch guns, eight five-inch guns, and 20-millimeter and 40-millimeter antiaircraft guns. Her shakedown cruise to Europe began on August 30, 1930. After returning in October, she made a ten-day visit to Houston. In January 1931 she passed through the Panama Canal en route to the Orient, where she remained until 1933. Back in the Atlantic in July 1934 she took President Franklin D. Roosevelt on a 12,000-mile cruise; he was aboard again in 1935, 1938, and 1939. The Houston was the flagship of the Asiatic Fleet when war with Japan began in 1941. At that time the Asiatic Fleet consisted of only a few auxiliary ships, two squadrons of PBY flying boats, thirteen antiquated destroyers, twenty-nine submarines, two light cruisers, and one heavy cruiser, the USS Houston. Capt. Albert H. Rooks took command of the ship in August 1939 and remained her commander until he was killed the night she was sunk in the Java Sea. The Houston was reported sunk by the Japanese so many times during the early months of World War II that she was nicknamed the "Galloping Ghost of the Java Coast." Albert H. Rooks, Captain of the USS Houston (CA-30). Courtesy of the University of Houston Libraries. Image available on the Internet and included in accordance with Title 17 U.S.C. Section 107. Painting, Sinking of the USS Houston (CA-30) in the Battle of Sunda Strait, 1942, by Joseph Fleischman. Courtesy of the Naval History and Heritage Command and the United States Naval Institute. Image available on the Internet and included in accordance with Title 17 U.S.C. Section 107. During February 1942 she participated in the battles of the Flores Sea, the Banda Sea, the Java Sea, and the Sundra Straits. Operating out of Darwin, Australia, in a task force under Rear Adm. Karel W. F. M. Doorman of the Netherlands Royal Navy, she participated in attacks on Balikpapan and protected Allied troop transports from Japanese air attacks. On February 27 the task force moved to intercept a gigantic Japanese invasion force believed to contain fifty to sixty transport and support ships, the carrier Ryujo, four heavy cruisers, three light cruisers, and numerous destroyers. Samuel Eliot Morison describes the battle as "Houston's great fight, the last half hour of it waged against overwhelming odds...one of the most gallant in American Naval annals." It began with a cryptic message received by the naval radio station on Corregidor in the Philippines at 11:30 P.M., February 28, 1942: "Enemy forces engaged." Nothing more was heard, and the fate of the Houston was not learned until some three years later, after the war. 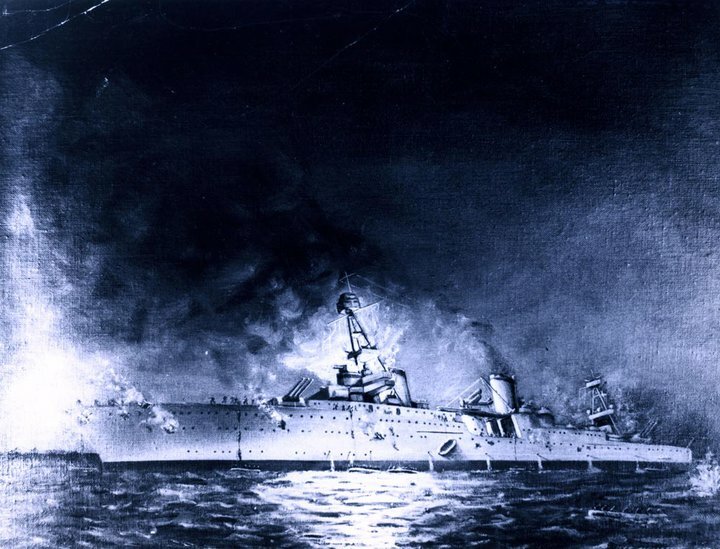 Hemmed in on all sides by a growing concentration of enemy ships, the Houston was sunk at 12:30 A.M., March 1, 1942. Of her crew of 1,015 officers and men, 655 were killed in action, drowned, or slaughtered, and 360 escaped ship and were captured. Seventy-five of those prisoners of war died, and 285 survived 3½ years in Japanese prison camps. On April 21, 1960, a shrine was dedicated to the USS Houston aboard the USS Texas. Twenty survivors attended the dedication. Houston Post, April 21, 1960. Duane P. Schultz, The Last Battle Station (New York: St. Martin's Press, 1985). Walter Winslow, The Ghost That Died at Sundra Strait (Annapolis, Maryland: Naval Institute Press, 1984). Handbook of Texas Online, Art Leatherwood, "HOUSTON," accessed April 19, 2019, http://www.tshaonline.org/handbook/online/articles/qth02.